Freedom Rockz: Free @ © 2017 Burgess Seed and Plant Co.
Free @ © 2017 Burgess Seed and Plant Co.
Get a free Garden catalog for 2017 @ © 2017 Burgess Seed and Plant Co. Did you know © 2017 Burgess Seed and Plant Co. has been around since 1912! Just click the link below to go to their website. Once on their website sign up to receive your new catalog by snail mail. While you are at it check out their amazing prices! Happy gardening! 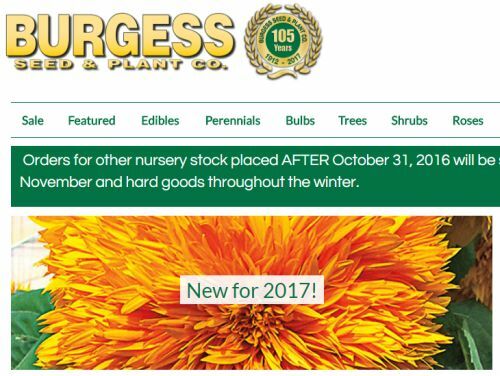 Free Seed Catalog @ © 2017 Burgess Seed and Plant Co.